Come learn how to use tools! Covers basic safety, operation, and use of woodworking tools. In this class we will work on a basic shelving unit at a Bountiful Cities garden in Montford. $25 for members, $30 for non-members. 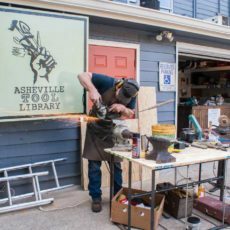 To sign up, email librarian@ashevilletoollibrary.org. It’ll be fun! Bring in items you need repaired. There will be experts from assorted fields to help you fix them or fix them for you. Prices will depend on the fix and parts required. We’ll post specifics as the event gets closer.